Colour Cam Cam model – photos taken, just the text to write. Finally took delivery of coloured card today. 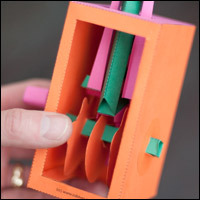 I've put together the cam cam version of the dodo mechanism in a charming range of clashing colours. Lovely! I've completed the photo set showing the construction of this mechanism. I'll be making it available as a download to members in the next day or so.